My love for the mountains goes back to high school days. The first time my family visited mountains was on a Labor Day weekend in North Georgia. The air was crisp and cold and a great relief from the humid dog days of early September. It was love at first sight for me. But it was only getting my feet wet as a result of things I’d been told during childhood. It was Uncle Roy Stroud that started it. After a Sunday meal at Grandma’s house, my cousin and I were engaged in a game of Battleship, and I had managed a couple of hits on my ‘foe’, which appeared to disgruntle my cousin, maybe because girls weren’t supposed to be any good at games like that, or maybe just because of his competitiveness. Uncle Roy stopped in and pulled up a chair. He sat perched on one heel on the chair while the other foot reached to the floor; combined with his lean build, the pose was something like that of a wood stork. He spoke of places that seemed so magical they couldn’t possibly be real. He assured us they were real. 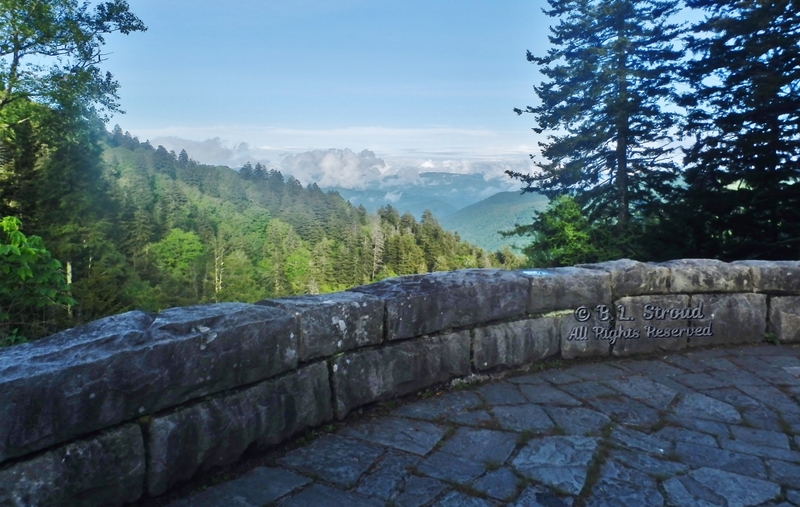 A road that winds through mountaintops and valleys and curves so tightly it winds back and crosses itself (switch back or ‘The Loop” in Newfound Gap Road, Great Smoky Mountains) . Mountains so big that a road couldn’t be made to go around it so tunnels were cut through them instead. Waterfalls you could drive your car under (Bridal Veil Falls, Hwy 64 Highlands NC), a waterfall you can walk all the way under without getting wet (Dry Falls, Hwy 64 Highlands NC). One day, I wanted to see these dreamy, magical places for myself. The next guilty party was Uncle Rollie Portwood. Like Uncle Roy, he could tell you about places and things that seemed too wondrous to be real. Swinging bridges high on a mountain. Bible verses carved into mountainsides (Fields of the Wood, Murphy NC) hoarfrost and rime ice and the eerie sculptures they made in the grasses and trees. The next time I was to visit the mountains was when Uncle Rollie and Aunt Bobby invited me to go along on their Thanksgiving trip. Uncle Rollie knows all the good places to ride, see, visit and generally gape at. Never will that wondrous trip be forgotten. 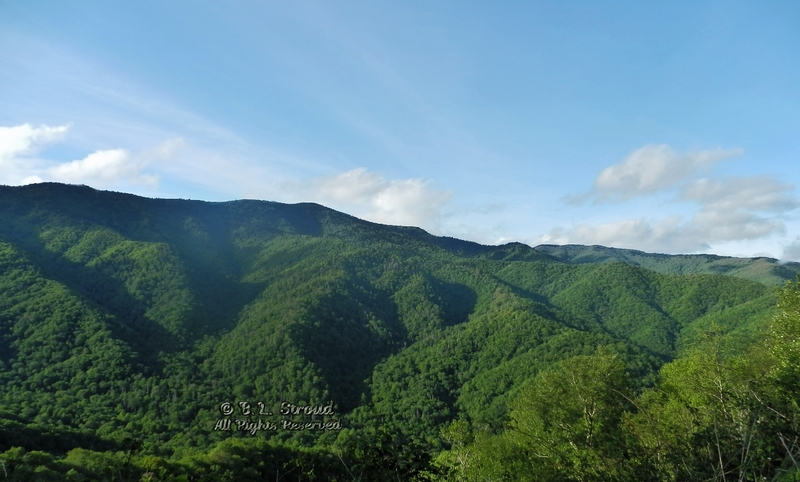 During the 90s I carefully planned a trip up the Cherokee Foothills Parkway in western South Carolina, what some natives refer to as the upcountry of South Carolina due to the escarpment and fall lines and a few mountains in the westernmost part of the state. The trip went somewhat wrong when I reached Pickens, SC and caught sight of the rolling mountains in the near distance. Suddenly, my car forget where it was going and headed straight into those hills, on a road with zero pullouts and places to turn around. 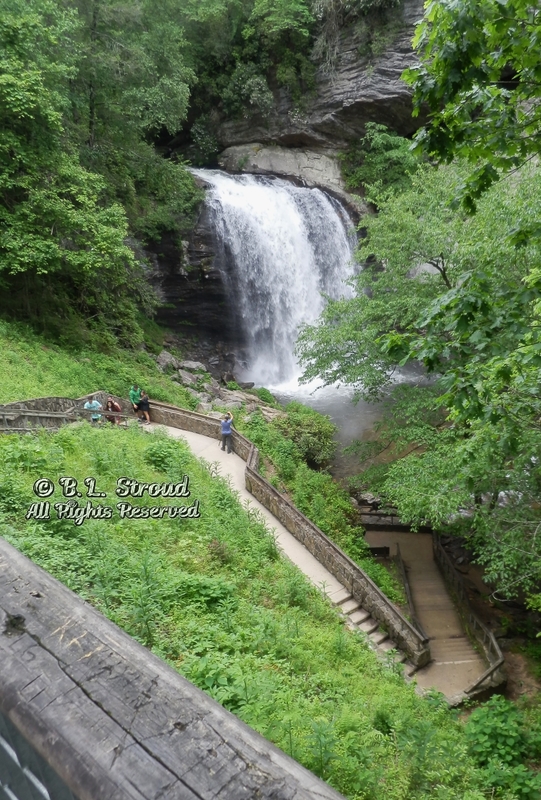 The car and I wound up in Brevard NC where I cruised up Hwy 276 in the Pisgah National forest through lush fern meadows, Looking Glass Falls, Sliding Rock, The Cradle of Forestry and up to the Cold Mountain Overlook on the Blue Ridge Parkway. On the way back home, I paused to look from the heights upon Lake Jocassee and hiked a short trail to Whitewater Falls. There have been other trips to the mountains but one special one was when my Pa and sister accompanied me. There, we stood in the mists of Bridal Veil Falls and Dry Falls, that Uncle Roy, my Pa’s brother, had described so well so many years before. The last visit to the mountains I love so well was Nov 2004. 12 1/2 years ago. Which brings me up to date. The mountains were pulling at me to the point they invaded my dreams. I simply HAD to go visit them, it has been far too long since last we met. The mountains are calling and I must go is an understatement to how it felt to want to go there almost desperately. Now, let me tell you about my recent trip to North Carolina. It almost didn’t happen. Timing between renting a mountain capable SUV, scheduling the best time to go, finding a dog friendly reasonably priced, safe and quiet place with green space to stay was presenting problems. It just didn’t seem to be coming together. At one point it seemed prudent to just forget it. Then that reaction seemed juvenile. For every angle I tried to work the ‘problem’ another frustration would present itself. Finally, I focused on what I could do rather than all the things I wanted to do in a short time. 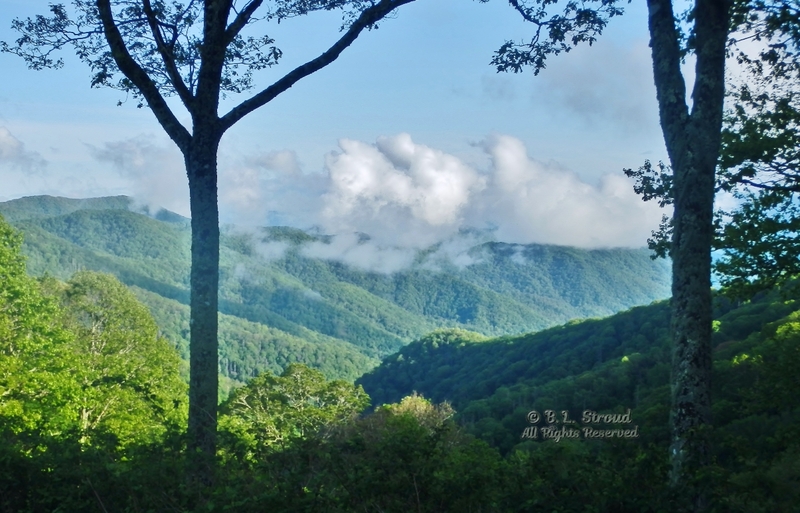 After settling on a brief drive through the Great Smoky Mountains followed the next day by cruising a section of the Blue Ridge Parkway, things fell into place. Lined up reservations for an SUV and a hotel I’d researched. All set. Then, the forecast called for rain. All day. Both days. Being too far into it to stop now, I went anyway. About 45 minutes into the 3.5 hour drive, water plopped on the windshield, then stopped. Then it a light shower smattered across the glass. Then it stopped. Then it rained steadily for a mile or two. Then stopped. Then it misted rain. Then it stopped. This went on for about 2 hours or so. I took a couple of stops for stretching the legs, flexing the back and giving the boys (my two dogs) a decent but short walk. We kept going. Clayton, Mountain City and Tallulah Falls were pleasantly cool and misty. Just south of Franklin, NC the skies opened up and bestowed a deluge of rain upon the earth. At least the windshield wipers finally got the go ahead to have a nice rhythmic workout in cleaning the windshield. Just north of Franklin, events turned again. 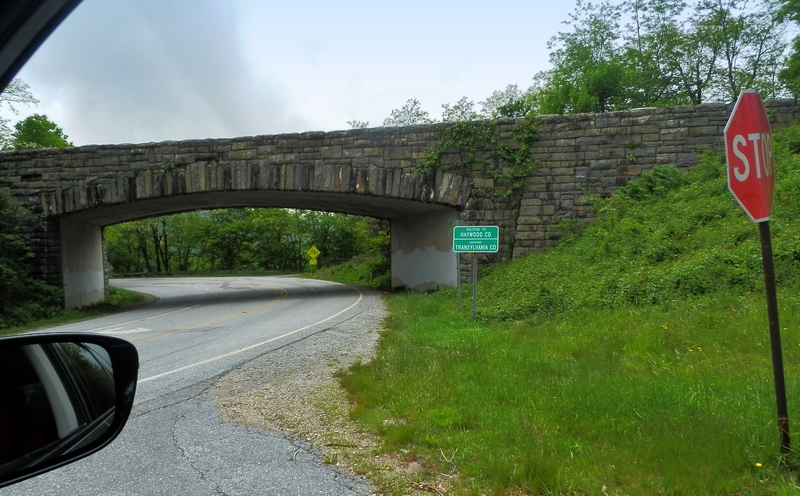 Hwy 74/441 climbs from about 2100 ft in elevation to roughly 5000 feet in elevation in just a few miles (approx. 3-4). It’s harrowing to someone like me who is not quite accustomed to the steep grade and cambered curves. Add in a very wet road and it made for a few minutes of jaw grinding, steering wheel clenching tense driving. No matter that it’s five nicely sized lanes-it was nerve wracking! Then the rain lightened to a shower. 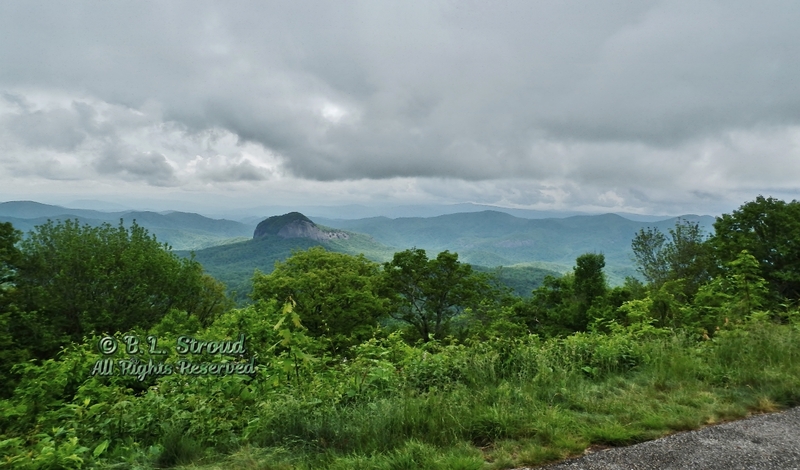 Though the rain slowed, clouds obscured all but the closest mountains and valleys. Distant views were not to be had. We soon rolled into Cherokee NC, and the rain stopped. Just like that. I pulled up and parked at the motel I’d chosen. It’s a simple place that hearkens back to a time when we as a nation were urged to “see the USA in a Chevrolet” and to “get your kicks on Route 66”. 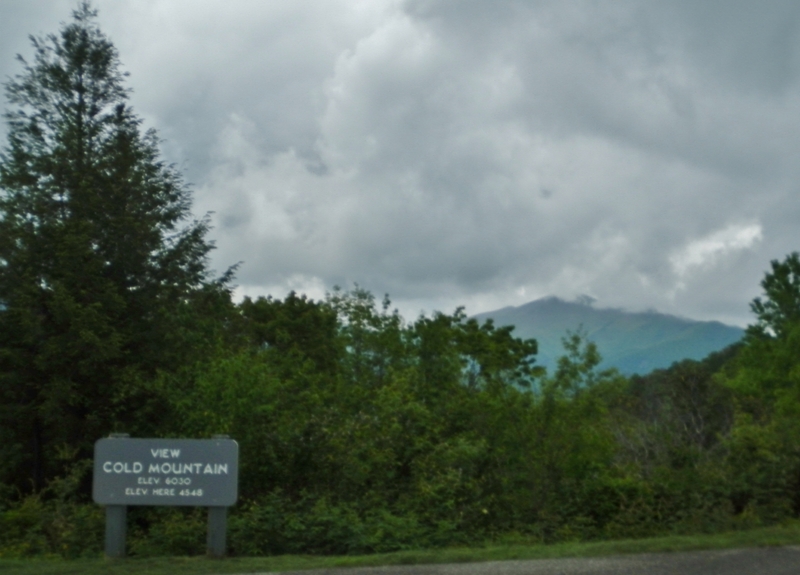 Just off the street, close to both the southern end of the Blue Ridge Parkway and the Great Smoky Mountains National Park- its neon sign, pink bathroom tiles, sunken tubs, family picnic areas perched at the Oconaluftee River was just what we needed. It was clean, quiet and had the perfect location for me and the boys. The retrospective design of the motel made me nostalgic for those days of Uncle Roy, Uncle Rollie telling me about road trips to the mountains. It felt like home. After checking in, walking the dogs, checking out the Oconaluftee River, getting a bite to eat, it came to my notice that not only was it no longer raining, the sun had come out! Takoda partaking in his favorite passtime. Have blankie will sleep. 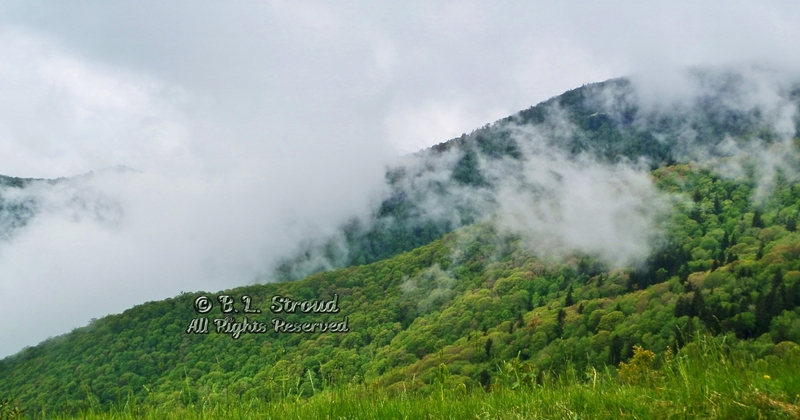 So we climbed back in the car and cruised through the Great Smoky Mountains. Memories of each time I’d been in communion with my beloved mountains filtered through my mind as we drove along. I stopped at the Chimney Tops overlook to remember those lives lost in the fires of 2016 and take a couple of shots of the crest of the Chimneys. 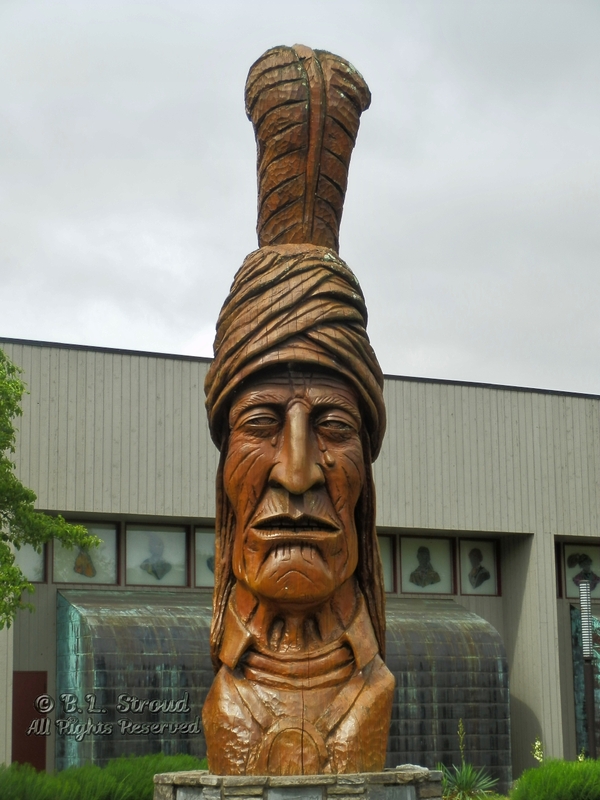 The next day, we stopped in downtown Cherokee before heading off onto the Blue Ridge Parkway. The drive was nervewracking. While trying very hard to focus on the road instead of the steep drop inches from the car tires, memories rose and managed to ease my growing tension at the wheel. 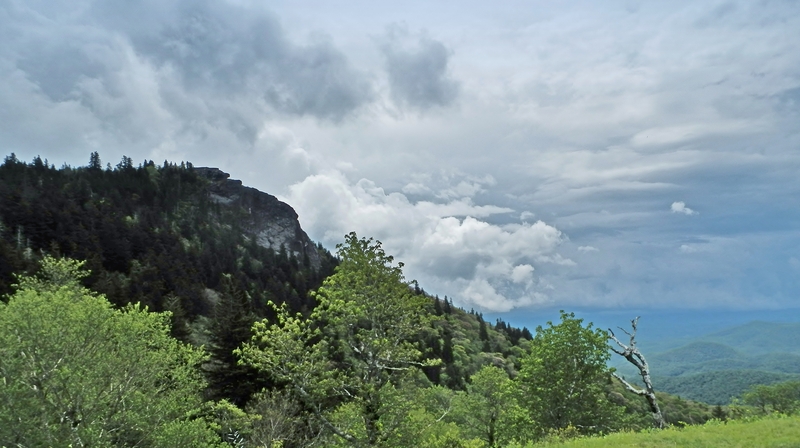 Remembering the Chimney Tops and standing there with Uncle Rollie, whorls of a cloud dancing up the sharp curve of the road only to dissipate just before it reached us. Moments after, morning mists rose from the valley up the mountainside, pausing to hover and twirl just in front of me on the road for a breath of a moment before continuing its ascent to the heavens. Thinking of Aunt Carol speaking of the mountains, one of the places she said she loved and called it God’s green country. Later, at a stop, a gathering of butterflies reminded me again of her. New memories were made too. A glimpse of a gorgeous sunset reflecting on the dissipating storm clouds in the Smoky Mountains the evening before. Branigan enjoying the banks of the Oconaluftee, the likely scent of groundhog (I saw it-Branigan didn’t) geese and ducks among the smorgasbord of aromas. Branigan prancing around and drinking in the heady scents of the crips aire in a small high mountain meadow at Bear Trap Gap. Tiny yellow flowers turned their faces to the sky and the green grass still sparkled with dew. The aroma of freshly cut grass drifting up from the valley. Takoda flatly refusing to exit the car by scooting to the back where I couldn’t reach him. Seeing the play of light and shadows against a myriad of greens as mists rise to merge with clouds. Coming around a bend to be greeted by the dramatic grandeur of Devils Courthouse. 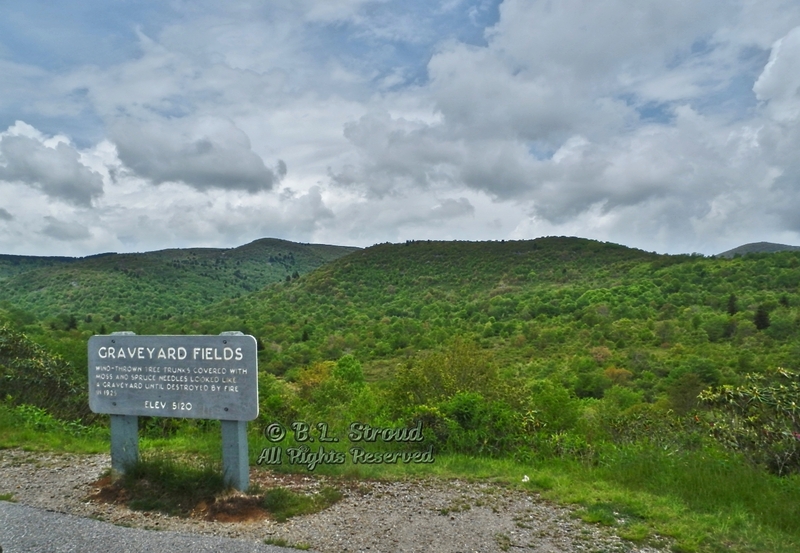 The delight of Looking Glass Rock, followed by Graveyard Fields, a place I’d had on my wish list for years. 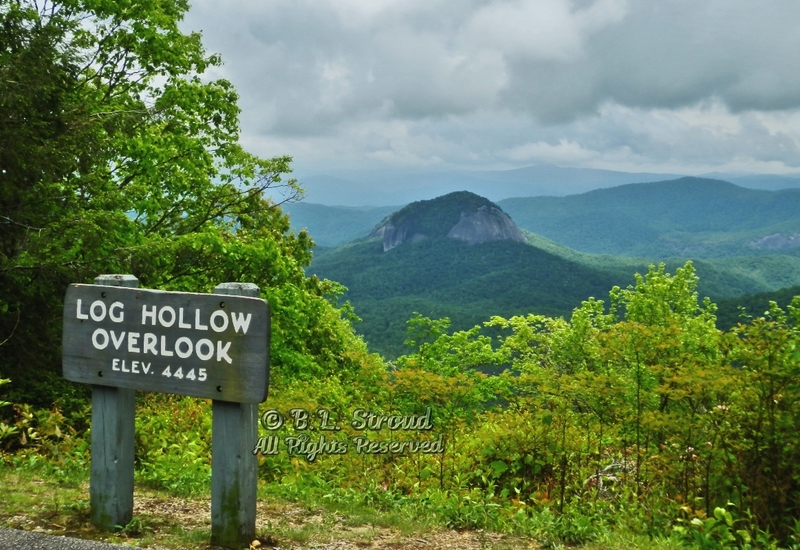 Paying tribute to Cold Mountain on the approximate 20th year anniversary from that accidental detour from Cherokee Foothills to Brevard NC. Sights I’d not seen before and sights exactly like that I’ll never see again. And I’m reminded; not every obstacle is a dark omen. It’s just life. Faith doesn’t tell us that the road will always be smooth and/or easy. Faith tells us we go ahead anyway. So we use our judgement and the good sense we’ve been given, decide the best course of action and go ahead, tired, scared, and/or apprehensive. Faith tells us we are not alone. Alternatively, you can sit and boo hoo and whine about things and never get up, shake yourself off and move forward. And you’ll miss out on some pretty good things. Overall, it was a worthwhile trip. Admittedly, I didn’t necessarily enjoy the getting there, but the being there was heavenly. Thanks for reading. Happy adventures beyond the front door. 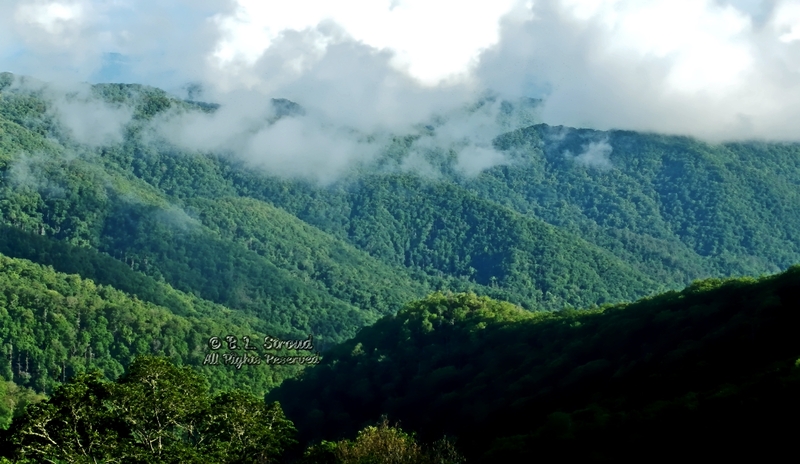 Many years ago, I journeyed to the mountains of Northwest Georgia. After a short visit to Amicalola Falls, the road began to wander through miles of apple orchards. Noticing the fuel gauge dropping, I stopped at the next decent gas station and refueled. Perhaps a bit of near empty tank anxiety clung to my psyche for shortly after I took a wrong turn. At first it made me nervous and I was downright frightened of becoming lost. Soon however, the rolling hills and gentle curves began to soothe my spirit and so the road beckoned me onward. It was early morning and the mountain mists were still flirting with the dew kissed meadows. The road wound itself around the base of a mountain, straightening for a brief moment beside a pasture. As the sun peeked through the mists a white horse lifted its head amidst the sweet grasses and wildflowers. It may have been curious about the car, its creeping slow speed, the human at the wheel with mouth gaping open in amazement. The serene moment was quickly stolen by the restless road, curving around yet another mountain base. It doubled back on itself and eventually ran back into the main road that funneled me onto the valley road. I hadn’t gotten lost. The road had gently teased me into going forward and gifted me with scenes peppered with little delights so perfect and so fleeting it would be easy to pass them off as a dream. It was not a dream. Cruising down that mountain valley road had been very real, leaving me with images burned indelibly into my mind. I was grateful, for it had refreshed my weary soul at a time when it was thirsty for such respite. Metaphors come to mind, so cliché and yet so relevant. Roads and paths sometimes present themselves to us and we are not sure which direction to go. Barring recklessness or apparent danger, last-minute decisions can sometimes be wonderful. The road may be difficult and it may only get you from point A to point B, it may be shorter and easier, it might have delights waiting just around the bend. Trust your angels. Trust your instincts. Take the random road. Expect the unexpected. Enjoy the surprises and treasures waiting for you. Be curious but not reckless. Navigate carefully the obstacles and pot holes that can be lessons. Don’t let fear make all your decisions for you. And always have a back up plan. Like an auto club membership, GPS or a good old-fashioned map. Go ahead, get lost in your surroundings once in a while. You may just find you’re not so lost after all. Unless otherwise noted, all content in blogs created by me is my intellectual property and may not be copied or redistributed without my express written permission. and may not be reproduced, downloaded, redistributed, copied, or re-posted in any way without express written permission by me. You may provide the link to this blog for sharing purposes only. If you need to use any of my materials, please contact me.